I've been wanting to make tres leches cake for a few years. With Cinco de Mayo just around the corner, I've been searching for a Mexican dessert to add to my Mexican recipes repertoire. I wanted something a little different than just the standard tres leches cake so with a little inspiration from my April Secret Recipe Club partner, Flavors by Four, I created the Chocolate Malt Tres Leches Cake. For this month's Secret Recipe Club I was assigned Flavors by Four, written by a mother daughter team. There are so many delicious recipes to choose from on their site, but I wanted something for Cinco de Mayo. Luckily for me Flavors by Four has a tres leches cake recipe! I really wanted to try something different with the tres leches, though, so I decided to adapt their recipe and make a chocolate malt tres leches cake. I'm not sure how I feel about this cake. It was not nearly as thick as I had imagined. I think maybe subbing out the flour for the cocoa powder made it rise less. But what it lacked in height, it made up for in flavor! This cake was really, really good. I made sure to have a tres leches cake expert test it, because I had no idea what tres leches cake was supposed to taste like, and it passed with flying colors. I'm thinking that maybe tres leches cake just takes a little getting used to. Grease a 9 x 13 cake pan and pre-heat the oven to 350 degrees. In a very large mixing bowl, whisk together flour, cocoa powder, malt powder and salt. Set aside. Put the egg yolks and 3/4 cup sugar in the bowl of a stand mixer fixed with a whisk attachment. Whisk on medium high speed until the mixture is thick. Add milk and vanilla to the bowl of the stand mixer. Mix just until combined. Add the wet ingredients in the stand mixer bowl to the dry ingredients in the mixing bowl. Stir to combine. Clean out the stand mixer bowl and whisk attachment. Add egg whites to the stand mixer bowl and beat on high speed until soft peaks form (about 3-4 minutes). While egg whites are whipping, add 1/4 cup sugar to them. Once egg whites are done, slowly and gently fold them in to the cake mixture in the large mixing bowl. Pour batter in to prepared baking pan and bake for 25 minutes or until a toothpick inserted in the middle of the cake comes out clean. Immediately invert cake on to a platter or baking sheet with a rim and allow to cool completely. In a large liquid measuring cup, stir together evaporated milk, condensed milk, heavy whipping cream and chocolate sauce. Prick cooled cake repeatedly with a fork to cover the entire top of the cake with holes. Slowly pour the milk mixture over the cake, allowing it to soak in. You may not use all of the milk mixture, but should try to use all of it. Set cake aside in the fridge for 30 minutes. Meanwhile, make the whipped cream topping. Whip together heaving whipping, sugar, cocoa powder and vanilla in a stand mixer fitted with a whisk until soft peaks form. Spread the whipped cream over the cake just before serving. Garnish with candies, if desired. Check out what other Secret Recipe Club members made this month! Looks lovely and I’ll bet it tasted great. I’ve never tried tres leches cake before and I’m running out of excuses now. I cant wait to try this out! Stopping by from Group A! Your cake looks so delicious! I’ve never tried tres leches, but I really want to! Oh, awesome – what a great take on a tres leches cake – great choice this month! This is a awesome Tres Leches Cake, can’t wait to taste it. Great cooking with you in Group B! one of my favorite desserts – looks so good! 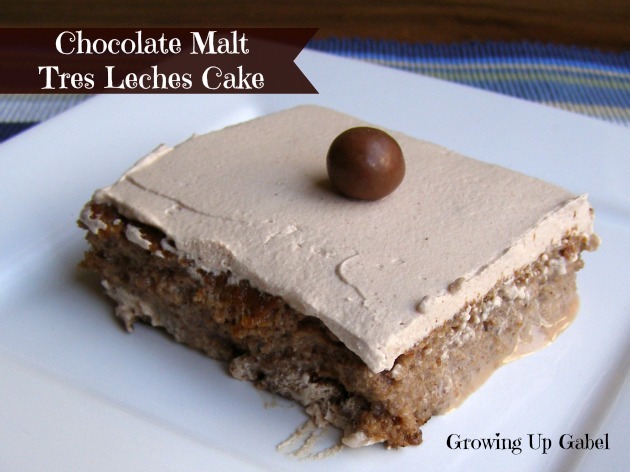 I’ve never tried tres leches cake before but this definitely makes me want to try it! Great SRC choice! I love chocolate malt flavour! This sounds delicious!